Can Anglers and Divers Help Fill Another’s Bag Limits? Answer: You can help your friends who are having a slow fishing day only if you are fishing from a boat on the ocean. “Boat limits” are allowed only for ocean anglers fishing for finfish while aboard a boat. This does not apply for divers or for people fishing for invertebrates (e.g. lobsters and crab) or for anglers fishing in freshwater lakes and streams. Boat limits mean that all licensed anglers (and anglers under 16) may keep fishing until enough fish have been caught to fill all the anglers’ collective bag limits. It doesn’t matter who caught the fish as long as nobody is over-limit when they depart the boat. This provision is allowed only in this situation for saltwater anglers fishing with hook and line. 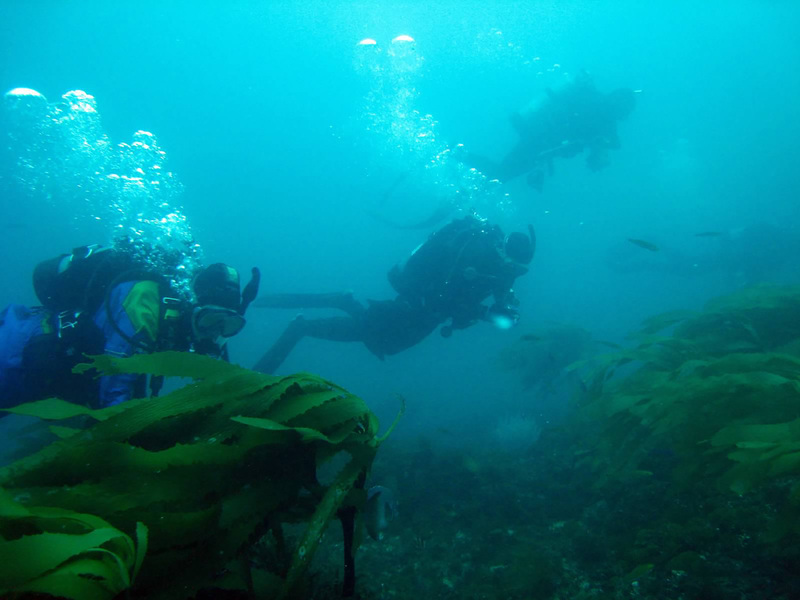 It does not extend to divers or to shore fishermen or to people fishing in inland waters (California Code of Regulations, Title 14, section 27.60[c]). GPS collars for training hunting dogs? Answer: Yes, it’s true. GPS collars and collars with treeing switches are prohibited when using dogs for the pursuit/take of mammals (CCR Title 14, section 265(d)). GPS retrieval collars employ electronics that utilize satellite transmissions. Collars with treeing switches utilize a mercury switch mechanism that changes the collars’ signal transmission when the dog raises its head toward a treed animal. How is the high tide line within MPAs determined and enforced? Answer: The shoreline shown on nautical charts represents the line of contact between the land and water at a selected vertical datum. In areas affected by tidal fluctuations, this is usually the mean high-water line. In confined coastal waters of diminished tidal influence, a mean water level line may be used. The shoreline of interior waters (rivers, lakes) is usually a line representing a specified elevation above a selected datum. A shoreline is symbolized by a heavy line. Throw nets to catch baitfish in private lakes? Answer: California Department of Fish and Wildlife (CDFW) fishing regulations generally do not apply in any water that is self-contained without any hydrological connection to state waters, or to any fish that are planted by the owner or person in control of the property. In these waters fishing methods are not governed by CDFW regulations. However, it would be a violation of the law to transport fish alive from the water where they were taken (CCR Title 14, section 1.63). Can I mount a camera to my rifle scope to record my hunt? This entry was posted in Bait, Diving, Dog Training, Fines/Penalties/Citations, Finfish, Firearms/Ammunition, Freshwater Fishing, Hunting, Invertebrates, Lobsters, Marine Protected Areas (MPAs), Methods Of Take, Nets, Photography, Spear Fishing, Tackle, Uncategorized and tagged dog training, Duck Hunting, fishing tackle, Marine Protected Areas, regulations, rifle scopes, spearfishing, throw nets. Bookmark the permalink. Is it legal in California to own a mount of a wild animal that is illegal to hunt in California, but legal in another state? The critter is a Sand Hill Crane that is illegal to hunt in California, but was legally bagged in another state (some 15 states consider these game animals, but not California). Can I bring this mount to California and publicly display?